Each student is responsible for submitting their immunization records to Stamps Health Services. Below is what you must complete and the due dates for each term. Failure to complete each step will result in an incomplete record, which will result in a registration hold being placed on a student's account. ​Call us at (404) 894-1432 for assistance with your records. Schedule an appointment online or at 404-385-4995. Note: We will contact you through the email address you have on file with Georgia Tech if there are any issues with the immunization records you submit. Note: Students submitting immunization records while in the European Union are required to complete an additional consent form that is included in their forms above. READ all of the instructions below carefully. Download the immunization forms from the link in the upper right of this page. Please note that it is important to use our forms, as use of other forms may not complete all the requirements. Print and complete all applicable forms according to the instructions below. Medical Entrance Form (Page 1): This form must be completed ONLY if the student is less than 18 years of age. Parental signature is required. Certificate of Required Immunizations (Page 2): This form is required for all students. A physician or nurse must complete, sign, date, and stamp the form. Make sure to read the explanation of the requirements in the third column. Certificate of Recommended & Travel Immunizations (Page 3): Immunization on this page are optional (not required). If completed, the physician or nurse must complete, sign, date, and stamp the form. Tuberculosis (TB) Assessment (Pages 4 and 5): This form is required ONLY for all students born in the US or Canada. 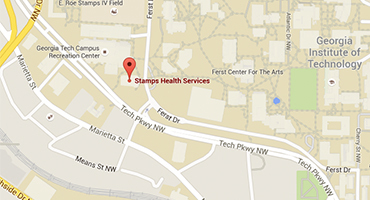 TB assessments must be performed within 6 months before you begin classes at Georgia Tech. The physician or nurse must complete, indicate if you are at risk, sign, date, and stamp the form. Tuberculosis (TB) Skin Testing (Page 6): This form is required ONLY for students born in the US or Canada if the TB assessment indicates risk for TB. TB skin test reading must be performed within 6 months before you begin classes at Georgia Tech. Results older than 6 months will not be accepted. The physician or nurse must complete, sign, date, and stamp the form. A QuantiFERON™ blood test is required for all international born students. The test must be performed within 6 months before you begin classes at Georgia Tech. Please submit the certified lab results with definitive lab values in English according to the World Health Organization standards. Foreign language reports and handwritten lab results will not be accepted. Stamps Health Services Consent for Collection and Processing of Sensitive Personal Data from the European Union (Pages 7-8): This form is ONLY required if the student is sending any of the forms and information required by items 1 through 6 above from the European Union. Immunization records sent from the European Union will not be processed by Stamps Health Services without a completed consent form. Log on to the Patient Portal using your standard GT login. Upload your completed forms and lab reports, then enter your immunization and blood test result dates on the above website. Please allow 5 business days to process your forms. Any questions or concerns regarding your immunizations will be communicated through your Georgia Tech email account.